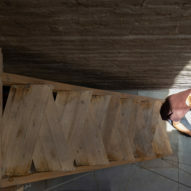 Sleeping spaces are suspended from the ceiling, and accessed by wooden steps and a walkway, at this 18th-century home renovated by Ecuadorian firm Al Borde Arquitectos. 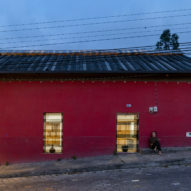 The House of the Flying Beds is located in La Esperanza, Ecuador, within a deteriorated historic property that Al Borde Arquitectos overhauled for a family. "At first sight the house gave the impression of not being useful at all," Borde said. 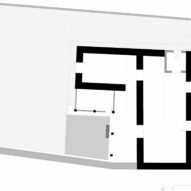 "It had only one-floor plan, the brick floor was broken, the 80 square meters were dark and cold, and the wood roof structure was rotten." 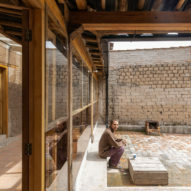 To rehabilitate the home, structural walls were reinforced, rammed-earth surfaces were treated, and doors and windows were updated. 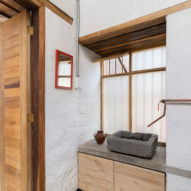 Walls were painted white with polished concrete on the ground floor to update the interiors. 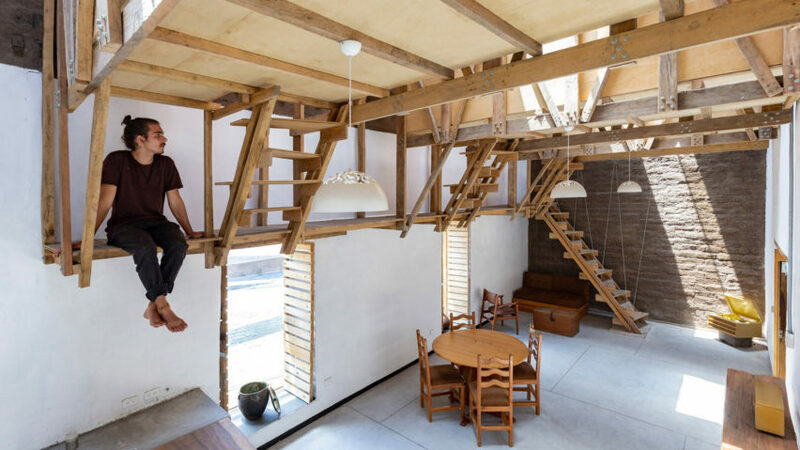 Retaining the open-plan layout of the main ground floor space and taking advantage of the double-height ceiling, the architects suspended the home's three beds from the ceiling. These are each accessed by climbing a wooden staircase with angled treads, which leads to a deck-like platform without any handrails. 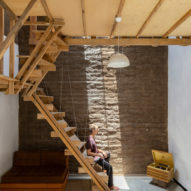 Three separate stairs then rise into the individual sleeping nooks, which are also built from wood, and incorporate storage areas for clothes and shoes. 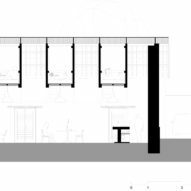 To enable this configuration, the ceiling had to be redesigned with an upper bond beam and eucalyptus trusses installed every 1.55 metres. 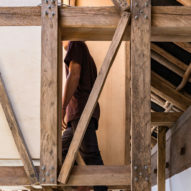 The bedrooms sit snugly between the trusses, which are visible from the space below. 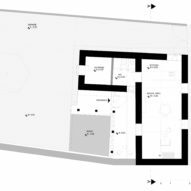 An open-plan kitchen, living and dining area fills the ground level, which is intended to be open and spacious for hosting guests. 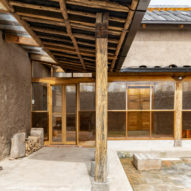 "The project is thought to receive visitors and friends all the time," said the studio. Furnishings are kept to a minimum, but include a loveseat under the staircase with a coffee table and chair, and a round dining table with four chairs. 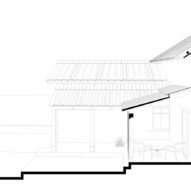 The home is accessed through an enclosed back porch, which fills the gap created by the L-shaped building. 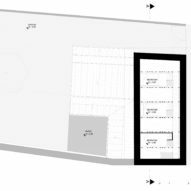 The ancillary wing contains washrooms and storage. From the patio and garden, the home appears hardly changed from when it was first built. 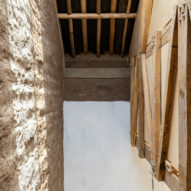 The exception is the roof, which is now covered in shingles made of old tires and features a ridge of recycled glass. House of the Flying Beds is coloured grey at the back and red across its front, making it stand out from the street. 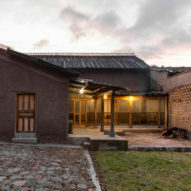 Also recently completed in Ecuador are a flat-roofed, two-storey home by Gabriel Rivera Arquitectos, and a residence with a curved concrete facade by Estudio Felipe Escudero – both located in the capital Quito. Casa Roca's curved concrete walls are designed to give an architectural "hug"